The following news release went out September 14 from Pacific Northwest National Laboratory, and has resulted in inquiries from both The Scientist and Nature magazines and an article was published in the News and Perspectives section of the Journal of the American Medical Association . The work, led by Robert Wind, was funded by the National Institute of Biomedical Imaging and Bioengineering and DOE's Office of Biological and Environmental Research's Medical Sciences Division. Some of the original support came from PNNL Independent Research and Development funds and the Biomolecular Systems Initiative. A spinning mouse works out the kinks in a new nuclear magnetic resonance system called "slow MAS" that researchers hope to adapt for use in human health, to see tissues and biological processes that are invisible to the magnetic resonance instruments being used in medical imaging today. The slow spinning is harmless to animals. RICHLAND, Wash. - This story is unabashedly all spin. What's the angle? Why, magic. Its subject—a mouse in a form-fitted Plexiglas tube—performs the honors, spinning like an old phonograph record, at a leisurely one to three revolutions a second. 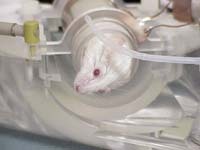 The mouse chamber is tilted just so inside a magnetic field being pelted with radio waves. The tiny rodent-adventurer and her cohorts are put under and are no worse for the wear. This technique, in turn, called slow magic-angle spinning magnetic resonance spectroscopy, or "slow MAS" for short, has provided researchers a new glimpse inside living tissue and cells that other biomedical imaging methods cannot render. The difference between conventional nuclear magnetic resonance, or NMR, and slow MAS is akin to a near-sighted person looking at a mountain range without his glasses one moment and with glasses the next. Once-indistinguishable peaks and valleys appear, the peaks in this case representing previously unseen biochemical compounds as they appear in living tissues. "It's a noninvasive way to look at function of living organs and the components at work in them such as fat, glucose and other metabolites," said Robert Wind, a physicist and laboratory fellow at the Department of Energy's Pacific Northwest National Laboratory, and slow-spin technique inventor. "We think this new technique can be used to diagnose diseases and assess the body's response to drugs and even to observe the working physiology of living cells." On September 14, at the 7th International Conference on Applications of NMR in Food Science in Copenhagen, Denmark, (http://www.models.kvl.dk/NMRinFood/), Wind described the technique and experiments that show slow MAS's potential for studying metabolism in muscle and organs. His spinning subject in this case was raw (and very dead) rabbit flesh. He also has taken disembodied mouse livers and brains for slow spins around the magnet, revealing chemical spectra in tissue up to 10 times the resolution seen in stationary NMR. At left, a stationary NMR spectrum of chemical compounds in an excised rat liver; right, rat liver spun at 40 revolutions a second at the magic angle, revealing chemical details invisible in the other. But it is living tissue that holds the most promise for this method, Wind said, because there is no good way to see what is happening in many areas of the body, especially at the boundaries of organs and tissues and bone or air cavities such as lungs and sinuses. Here, the large magnet used in NMR generates small magnetic fields that broaden the spectral lines so much that information about those fine details is lost. Wind's slow-spin technique, which can generate detailed spectra from these boundary regions, takes advantage of a quirk in NMR. NMR generates a spectral signature of compounds in a sample based on the frequencies of the sample's atomic nuclei as they jiggle in a strong magnetic field. 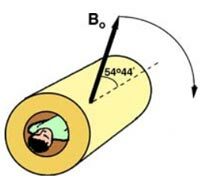 NMR pioneers noticed more than a half-century ago that they could get better spectral resolution if they spun a sample at a 54.7-degree angle to the magnetic field. The faster they spun a sample oriented in this so-called magic angle, the more structural detail they obtained. Slow MAS inventor Robert Wind believes the new technology can be applied to diagnosis of cancer and other diseases and used to see if drugs are working in the body as intended. "This was very fast spinning, an ultra-centrifuge, thousands of rotations per second," Wind said. "If you tried that with intact tissue or a live animal, you'd blow up your bio-sample and kill the subject." But what if you could slow the spinning down, so that a live animal could withstand the centrifugal force? The problem with slow MAS that Wind had to overcome was that it produced unwanted signals, what Wind and colleagues call "spinning side bands," that obscured the sample's spectra. Wind let the idea percolate for about six years as he worked on a combined NMR-optical microscope and other devices at the W.R. Wiley Environmental Molecular Sciences Laboratory on PNNL's Richland, Wash., campus. When he came at the problem again, he brought reinforcements, most notably in the person of NMR expert and PNNL staff scientist Jian Z. Hu. Working with Hu, Wind found he could get detailed spectra in biological samples at record-slow MAS speeds by using pulsed radio waves to separate the obscuring spinning side bands from the main spectrum. With this technique they could look at full bodies or zero in on specific organs or parts of tissues. Wind will continue to refine the technology, for which he recently received two patents, and PNNL will make it available for licensing. As a precursor to studies in humans, Wind said, safety trials in animals would be necessary to see how strong a field and fast a spin they could stand. He admitted that patients might balk at being spun and believes engineers can solve this by building magnets where the magnetic field is rotated around a person in a stationary chamber.